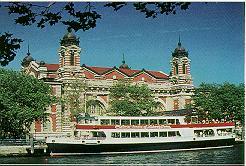 Jersey City History - Old Bergen - Chapter XXXV. RELIGION and education were considered of the utmost importance by the early Dutch settlers, and the church and school in the primitive days were very closely united, and under the control of the same governing body. Indeed, in most cases, the schoolhouse was built first, and served the double purpose of a place of instruction, and a house for church service. The great anxiety of the sturdy colonists was to perpetuate the faith of their fathers, and to procure means for the instruction of their youth. The Schepens of the Village of Bergen, having observed and considered the fatherly direction and care of your Hon. Worships, in erecting church and schoolhouses, they request that they may have a God-fearing man, and preacher to be an example to, and teach the fear of God in, the Community of Bergen, and its jurisdiction. They state that the inhabitants now pay of their own free will, a yearly contribution of four hundred and seventeen guilders, in wampum, and would do more. They therefore think that your Noble Honors should send one over at your own expense, for one or two years, until the land should so increase in value, that the goodhearted could liberally give. Just when and where the first church or schoolhouse was erected, it is impossible to state positively, but it would seem from this petition, that at least one, or perhaps both, were in existence at this date, as the chief anxiety of the people seems to have been to procure a minister from the Company. Tradition says that the first church services were held in the building -- probably the schoolhouse just alluded to, -- located at the northeast corner of the old graveyard (near the corner of Tuers Avenue and Vroom Street), and the bulk of testimony corroborates this. The divine service of the day was without much doubt held there until the erection of the church in 1680. We learn from the records of the deacons of the church showing the collections taken, that church services have been maintained regularly at least since 1667. There seem to be no records in existence, of occurrences previous to that time. Oftentimes, as opportunity offered, some of the people would cross over to New Amsterdam, to attend the services held there in the Dutch church, although facilities were given them for divine service at home. In 1680, the people decided to begin the erection of their first church building proper, and on May 23, 1681, the dedicatory sermon was preached by Rev. Casper Van Zuren, from Long Island. The collection taken up on this occasion amounted to eighty-seven guilders and ten stivers, or nearly forty dollars of our money. 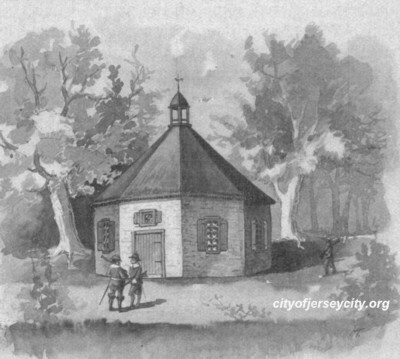 The church was a stone building, octagonal in shape and was located near the corner of Bergen Avenue and Vroom Street. It was surmounted by a brass rooster for a weathercock, which was transferred, on the demolition of the building in 1773, to the spire of the edifice that succeeded the "little church" at that date; and in 1841 when this second church was in turn pulled down, the vane was placed on the cupola of the Columbian Academy. In the early '50's, a gunner returning from his day's sport, perhaps in an exhilarated state, and imagining he had discovered a rare kind of game, levelled his gun at the old weathercock, and damaged it to such an extent that it was taken down and repaired with iron braces. It was then replaced, but soon the action of the weather again weakened it, and a well-directed stone from the hand of an ambitious youngster completed the work of destruction. One of the old residents in the vicinity of Bergen Square had a facsimile of the original made and placed on the present School No. 11, where it still remains to mystify onlookers as to the direction of the wind. In the interior of the old church, seats were placed around the wall for the male worshippers, while the women occupied high-backed chairs, which were their personal property. Some of these chairs are still cherished as heirlooms by the descendants of their original owners. In the winter season, the foot-stove was carried to and from service, and this was a very necessary companion, for otherwise there were no fa cilities for producing artificial warmth. It was a small box of wood, perforated, and containing a metal cup, in which the owner before leaving home, placed hot embers; making it a most acceptable footstool. The minister declaimed from a pulpit placed high above the congregation and surmounted by a sounding board, and at the end of his sermon admonished the deacons to collect the contributions of the people. For this purpose they used black velvet bags with bells attached and fastened to long poles, and by a judicious jingling, awakened not only the sleeping faculties of the drowsy ones, but it is hoped likewise their consciences. The voorleser occupied a position in front of and below the pulpit, from which he performed the services in the absence of the preacher, or led the singing at the regular services. For over ninety years the congregation was without a stated pastor; the voorleser, or schoolmaster, conducting the services on the Sabbath, which consisted of prayer, and reading a sermon prepared by one of the ablest theologians in the Fatherland. During the occasional absence of the voorleser, different members of the church performed his office; and at intervals, when ministers from different parts of the country happened to be at New York, they crossed the river to preach to the Bergen people. The names of the Revs. John and Samuel Megapolensis, Wilhelmus Niewwenliuysen, Caspar Van Zuren, Henricus Selyns, Gualterus Dubois, G. Bertholf, W. Lupardus, B. Freeman, of Schenectady ; R. Erickson, A. Curtenius, Cornelius Van Schie, of Fishkill ; J. Leyt, George W. Mancius, H. Marinas, and others, appear in the deacons' books of accounts; for the preachers were always remunerated for their services. Besides expenses and board, they received from twenty-five to seventy-two guilders per service. As is shown by the accounts, the ministers coming from New York were obliged to pay six guilders to the ferryman, and six guilders for a carriage from the ferry to Bergen. Cornelis Brinkerhoff was for years the person who discharged the duty of transporting the ministers ; while upon the Van Houten family rested the responsibility of providing sustenance and lodging for them, an expense of twelve guilders, seawant, being charged in the deacons' accounts after each visit. The amounts mentioned above were paid in wampum. This was obtained by the deacons from the authorities, and by them sold to the heads of the families composing the congregation; when collections were taken, this was dropped in the bags (a guilder equalled 20 stivers, a stiver an English penny). In 1679, the people agreed with the minister of the City, meaning New York, to administer the Lord's Supper three times a year, for which he received thirty bushels or fifteen bags of wheat. He performed this service on week days, because he could not be absent from the city on Sunday, as he was the only minister. In the same year twelve guilders were expended in the purchase of printed sermons, and December 31, 1682, the consistory authorized the purchase, for the sum of seventy-five pounds, of four large theological works, with the following titles: The Secret of Happiness in God, On the Epistles to the Philippians, Explanation of the Catechism, and The Trite Repentance. A "sand runner" or hour-glass stood on the desk 'n the church, and when the sand had run out of the upper part, the reader was obliged to suspend services, and dismiss the congregation. Engelbert Stuynhuysen (afterwards mentioned as schoolmaster) appears to have been the first voorleser, and served in that capacity from October, 1662, until about 1664 or 1665, when Reynier Bastiase Van Giesen was called upon to officiate in his stead. He continued therein for about forty-two years, and was followed by Adrien Vermeulen, who served for twenty-eight years, and on April 3, 1736, he was succeeded by P. Van Benthuysen, who filled the office for just twenty-five years, until April 3, 176)1. Abraham Sickles was then appointed, and was the last of the voorlesers of " Old Bergen," serving until 1789, when a "clerk" was appointed, at a salary of two pounds, fifteen shillings, per annum. The voorleser, besides receiving a salary for that office and as schoolmaster, was likewise paid for his services as bookkeeper and aanspreker, and perhaps received some token from the people for special services, as at marriages and baptisms. At the request of the people of Bergen, I have consented to preach there, three times a year, on Mondays both morning and afternoon, and administer the Lord's Supper. I found there a new church, and one hundred and thirty-four members. At other times, they are accustomed to come over the River here, to the hearing of the Word.